So, I didn’t know this, but apparently I am really into soup. I just realized that I have so many soup recipes I want to make and share with you guys over the next month or so. Like start expecting one a week. I am even sharing soups all over the internet at the moment. I don’t know if you’ve seen this yet, but umm, I recently made a buffalo chicken chili (with beer bread toast for dipping!!) for the first time and fell in love. <–If you didn’t already, click that link. Bring on the soup, right??? But who doesn’t love soup, it’s warm and comforting, and in today’s case, so cheesy. Broccoli cheddar soup is such a classic. 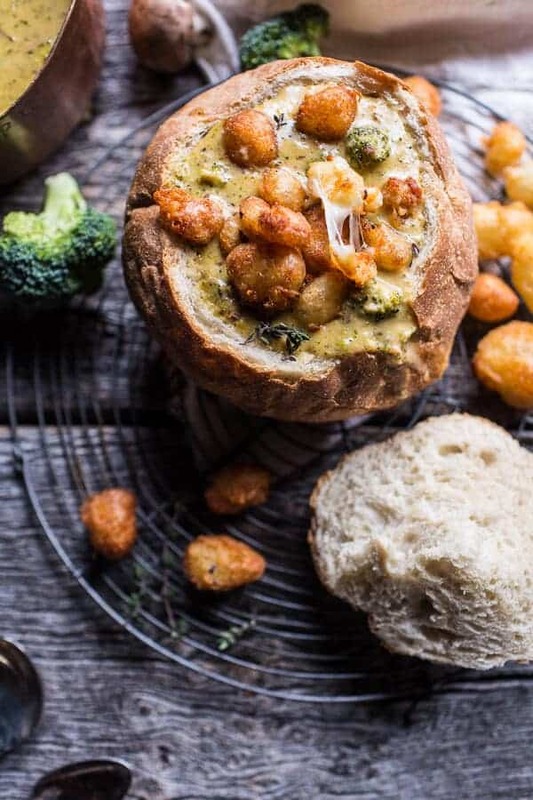 I have loved it since the very first time I ever had it as a kid at Panera…bread bowl and all. Actually, I think the bread bowl was my favorite part. I loved how it soaked up the cheese soup. I mean, the best, right?!? It seems every fall I come up with a slightly new way to show you guys broccoli cheddar soup. My very first year of blogging, I tried to copycat Panera’s recipe. The next year I added butternut squash and curry. Last year I made broccoli cheddar soup hand pies, and this year? This year I am going back to the classic, but adding fried cheese curds. Yes, cheese curds!! 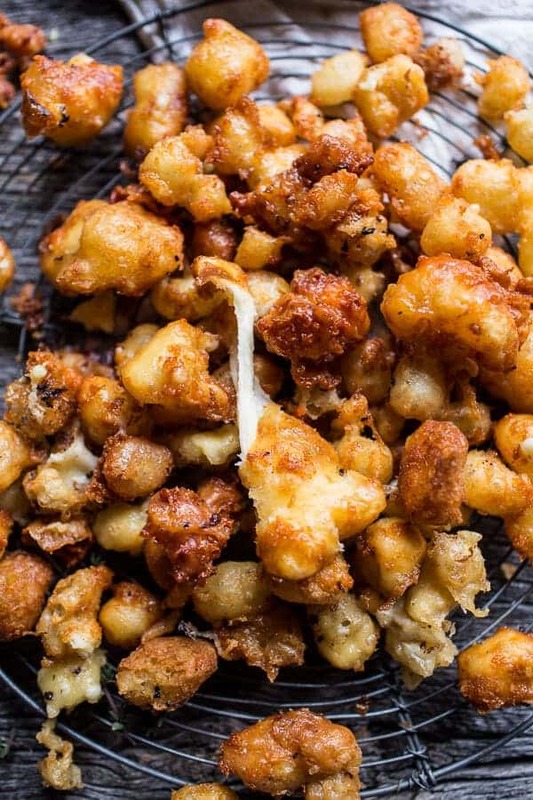 If you’ve never had cheese curds, now is the time. If you are possibly weirded out by them, GET OVER IT. Do you remember this summer when I went to Madison, Wisconsin? That was the trip I discovered and fell in love with cheese curds (ok and all things Wisconsin too!). And not just cheese curds themselves, but fried cheese curds. Like whoa. Yes. And WHOA. And then DELICIOUS. And I promise, I am not being paid to go on and on about cheese curds. I really just want to express how much I love them, and how I would be so excited if you tried them. Like it would make my day, no my week. I just know you will all love them. Honestly, there’s really no way you couldn’t, it’s fired cheese. Like I said earlier, I kept the broccoli cheddar soup pretty traditional. I didn’t want any crazy flavors to take away from those cheese curds. So the soup is quick and easy to make. It’s obviously delicious on its own and especially when served in a bread bowl. 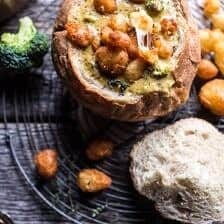 I couldn’t help but bring back my childhood favorite, so I made some bread bowls for the soup. There’s just something so amazing and fun about eating out of bread. FYI, bread rulz, my mom taught me that important life lesson. You can use regular bowls if that’s more your thing…but at least get some bread for dipping. No soup is complete with out carbs. Don’t argue that, I’ll stick with those words until I go to my grave! Yes, I am serious about my soup and bread. Ok, but the curds!! I am pretty sure cheese curds are widely available at most grocery stores now. I have seen them both at my local grocery store and my local Whole Foods. I used fresh Wisconsin Cheese curds for this soup because I have the bestest friends over at Wisconsin Cheese, and they kindly sent me some…sometimes on Fridays I’ll get a surprise package full of cheese curds. Can you say best Friday surprise ever or what?!? Anyway, frying cheese curds is the way to go if you are a newbie. They’re honestly down right incredible and there’s a large possibility you’ll eat all the curds before they even make it to the top of the soup. Once you try your first, you’ll understand what I’m saying. OH and?? I totally used pumpkin beer in my frying batter. 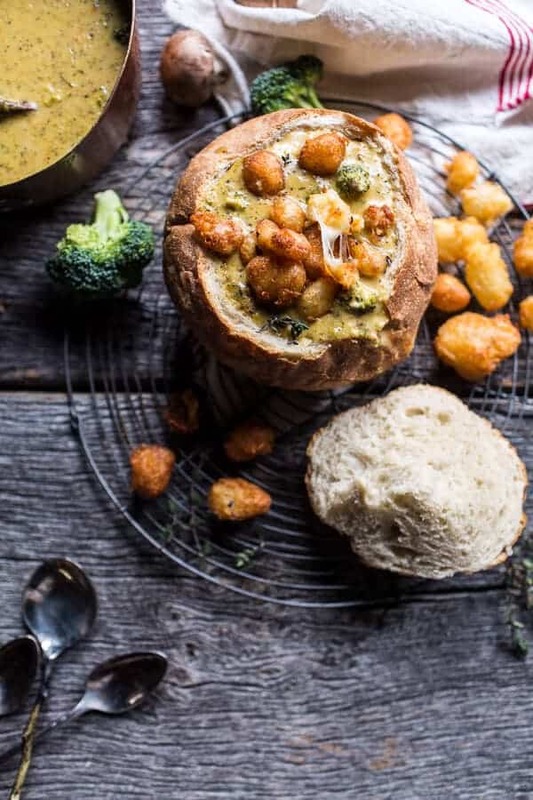 Broccoli cheddar soup with fried cheese curds – suddenly Thursday’s killin’ it! But who doesn't love soup, it's warm and comforting, and in today's case, so cheesy. Heat the butter + olive oil in a large dutch oven or pot over medium heat. Add the onion + mushrooms and cook until tender, about 10 minutes. Whisk in the flour and cook until golden, 3 to 4 minutes, then gradually whisk in the milk and broth until smooth. Add the broccoli, carrots, bay leaves, thyme, cayenne and nutmeg, then season with salt and pepper. Bring to a simmer, reduce the heat to medium and cook, uncovered, until the broccoli is tender, about 15-20 minutes. Once the broccoli is tender, remove at least half of the broccoli florets and the bay leaves from the the soup. Puree the remaining soup in batches in a blender until chunky-smooth. Return the soup to the pot. Add back the reserved broccoli. Add the cheese to the soup and whisk over medium heat until melted. 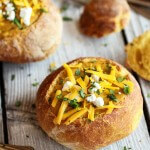 Divide the soup among the bread bowls (or regular bowls) and top with fried cheese curds (recipe below). Add the oil to a heavy bottom pot about an inch up the sides of the pot. Bring the oil to 375 degrees F.
In a bowl, combine the flour, salt and cayenne. Whisk in the beer and egg until a smooth batter forms. Working in batches dip a handful of curds through the batter and then carefully add them to the hot oil. Fry the curds until golden brown, 1 or 2 minutes. Drain on paper towels. Serve hot atop the warm soup. Fried cheese curd?!?! Girl, that’s epic! 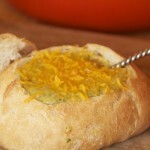 This soup, and those bread bowls, and just the whole thing is totally making me hungry! I love it! I love soups, but only just last month did I try a soup with broccoli, how weird is that? This one looks so good, I must try it! Gah! Broccoli and cheese is only like THA BEST. Then you add fried cheese? Soup out of a bread bowl is definitely the best. This soup looks so yummy and since we are bracing for a hurricane over here this weekend I’m making this bowl of comfort. 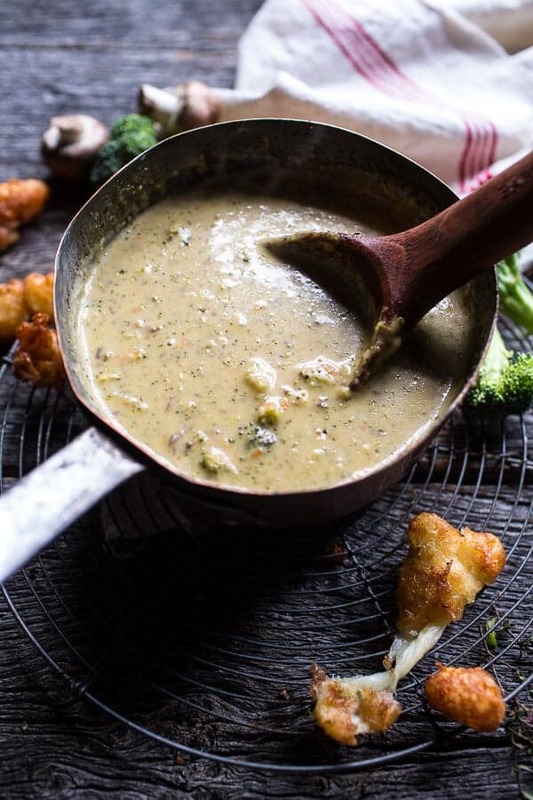 I am a huge soup fan too Tieghan, and this broccoli soup looks like it wouldn’t disappoint. It’s on my list! Those cheese curds!! Whoa!! Soup is my favorite thing to make. I love everything about this beautiful ensemble!! The cheese curds look awesome! Never had, but will definitely make! Let’s go Cheese Curds! This looks awesome. Definitely need this in my Fall repertoire. I could just nibble on those cheese balls all day! I’ve been looking for a good broccoli cheddar soup for AGES so I’m very glad you posted this!! Can’t wait to make it 🙂 And the cheese curds?! PLEASE. Just give it all to me now. I share your cheese curd obsession but seriously cannot find any good ones where I live. It’s sad. If I deep fried them and put them on this soup, though, they might not taste so average! You’re my food crush. 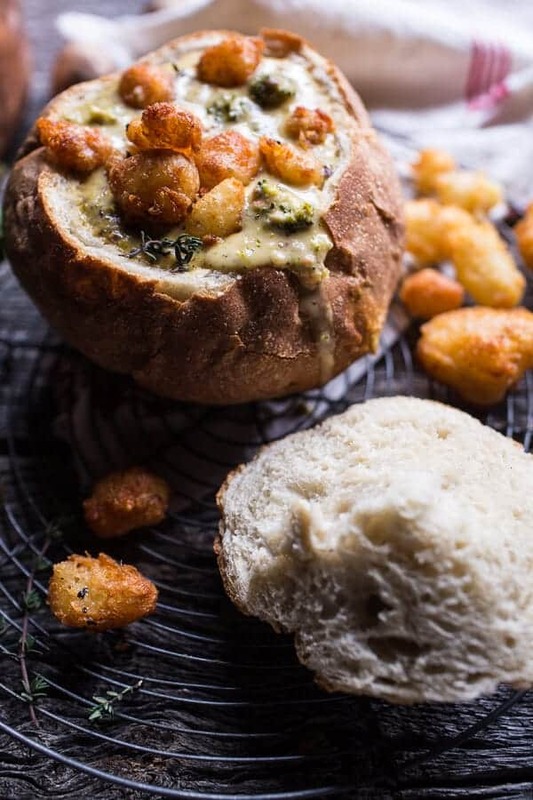 Cheese curds AND a bread bowl? This is awesome. Yes yes yes! I am a Wisconsin girl and I am ALL about that cheese. Cheese curds are the greatest, really. And in broccoli and cheddar soup. You’re making me so hungry! I can’t use beer in the batter. What would you recommend using in its place? Seltzer? Or something meatier? HI! Buttermilk or seltzer will both work great! Hope you love this soup, thanks!! OMG this looks so good I have to make it !!!! Do you think veggie broth as a sub for chicken would work?? Whoa…those curds are total genius. And on a wonderful soup! Keep all the soups coming!! 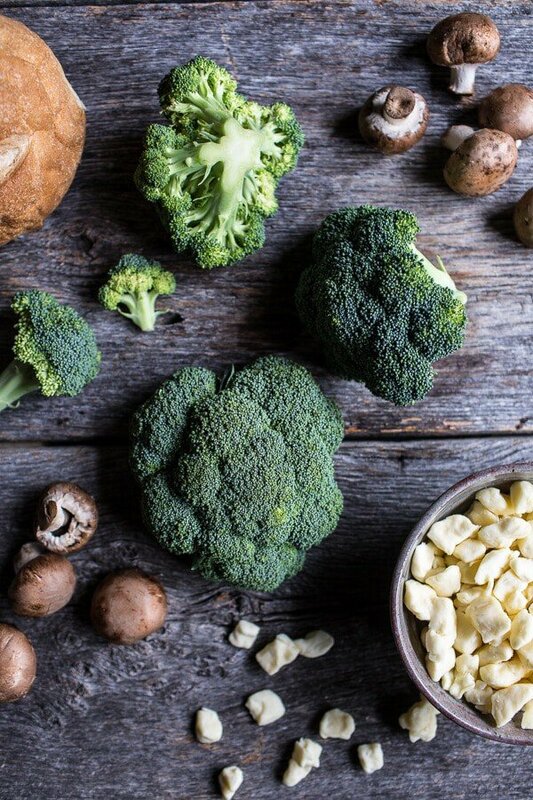 I am not a broccoli person but this sounds lovely! 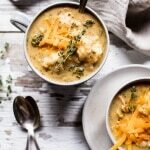 Broccoli and cheddar sound sooooooo comforting! 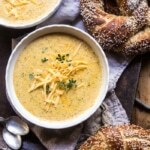 I’m not the biggest fan of cheddar….will this soup change my mind? Bring on the soup! 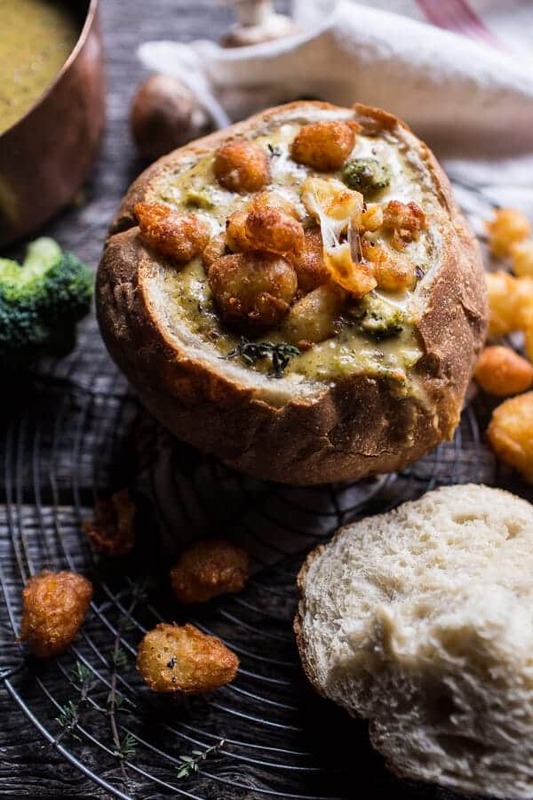 🙂 I love it and this looks so good, especially in those bread bowls! This looks absolutely AMAZING! Madison also turned me into a die-hard fried cheese curd lover…I can’t wait to try this recipe! Uhh this looks amazing! Do you think there’s any way to make this in a crock pot?? Thanks so much! Yes, I think once you cook the onions/veggies you can then add the remaining ingredients to a crockpot. Just add the cheese a few minutes before serving. Hope you love the soup!! Tieghan, this soup looks absolutely amazing! As soon as soup weather hits down here in Florida, you can be sure it will be on our table! Thanks Eva! Hope you love the soup! Made this for dinner last night! Delicious!!! I couldn’t find cheese curds in any of the supermarkets near where I live (in Hong Kong) so I chopped up pieces of haloumi cheese and fried them instead!! Also delicious, little cheesy croutons! OH! I bet that was amazing, I love Haloumi!! Thank you! Oh my gooooodness. I don’t think we can get cheese curds in the UK 🙁 But maybe that’s a good thing because otherwise I would be frying them up every day and eating the entire batch. They look amazing!! Thanks Becca! Hope you can maybe find some curds somewhere!! 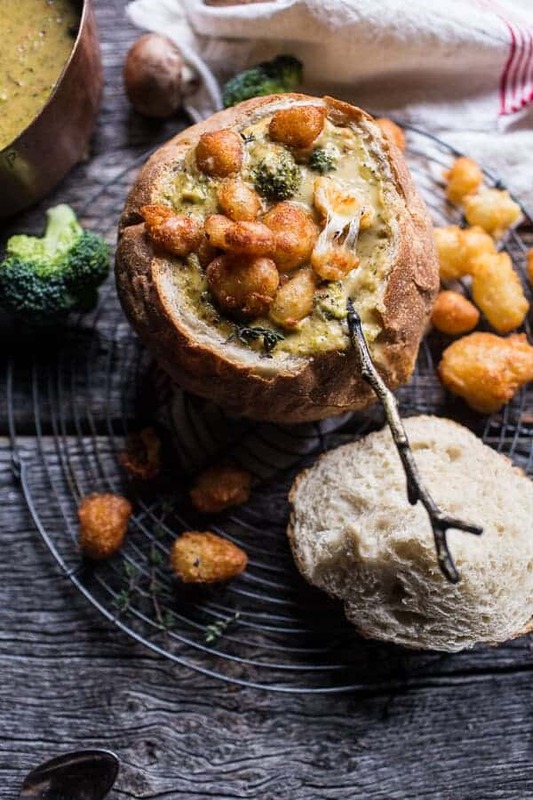 Man I didn’t think it could get any better than broccoli cheese soup in a bread bowl bu then you went and topped it with fried cheese curds! I’ll have to check that out, thanks Todd! Yup, another amazing recipe. Made this last night and it was a big hit….Loving your cookbook too! You are amazing!! I am so happy to hear that! Thank you so much Joanna! What have you made from the book so far? I don’t know why it didn’t let me hit reply to your question, but I just made and LOVED from your cookbook the Earl Grey Blueberry muffins and I also just made the Chicken Gyros, which were also delicious! Next on my list will be your El Paston Enchiladas! I am so glad you loved those Joanna! Thank you so much! I hope you love every other recipe you try as well! Hey! looking to make this soup a little off season, any recommendations if I can’t find a pumpkin beer?